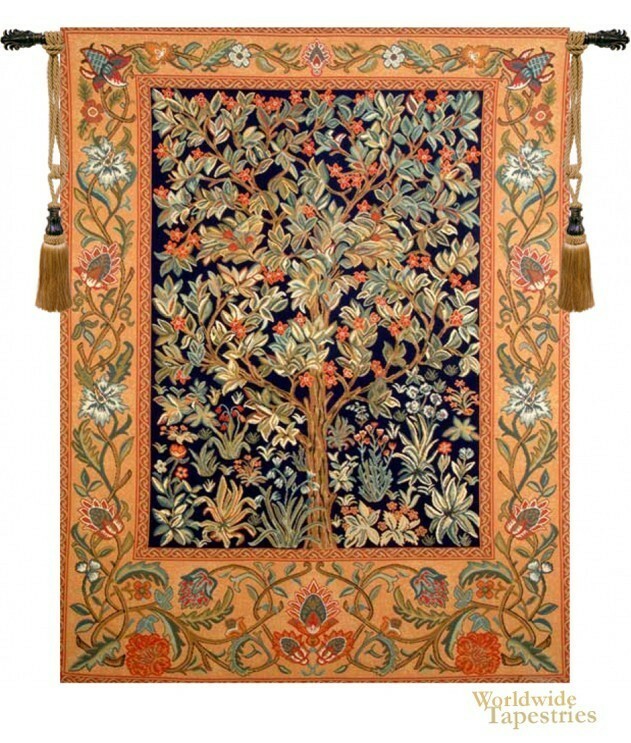 Full of vibrancy and color, this tree of Life tapestry "The Tree" is inspired from the works of William Morris. This work is exceptional in its color and design, showing orange, amber an gold tones and a sense of movement in the entire work from the intricacy of the design. Vines and flowers flow upward in the border as well as the flourishing tree with its bright apricot flowers and its beautiful yellow green flowers which complement each other wonderfully. The tree of life is a symbol of eternal renewal and life in many cultures, as the branches of the tree connect high to the heavens and the roots of the tree penetrate deep into the earth. This tapestry "The Tree" is lined and has a tunnel for easy hanging. Note: tapestry rod and tassels, where pictured, are purchased separately.